Finally flying companies are installing a new Wifi in their aircrafts. The first trials were more than a year ago and now it is reality. When you are stuck for several hours in a plane, some people try to sleep, others watch all the movies available and play several times the old caveman version in 16 colors on their personal screen. Of course this happens if you are in an Airbus or in business class and above. We all remember when the phones were installed on board. Everybody got very excited but finally nobody really used it. Of course some people spent some dollars trying to call someone but frankly it never really worked perfectly (especially for the cost). It disappeared quite fast as it became just ridiculous. Now since the internet revolution arrived, things are different. The era of Hyper-communication is here and every single electronic object has an internet connection. Mobile phone, computers, video games machines, even toy rabbits or Mp3 players. Business is also online. Distances became shorter and every single second, people make business via internet. Social media. Never people wanted so badly to stay in contact with their friends. No matter where, no matter how. So between a need for entertainment or/and business, internet is everywhere even in planes. It is now almost 10 years since American Airlines made a first test. It was not terrible and today still wifi on a plane is not great. Why? Well try to send a signal through a metal tube crossing the sky at 500 miles per hour. Also because most of the existing systems were based in the ground. So it is slow and costly. But apparently things are evolving and a new kind of satellites will exist from 2013. In deed some companies working very hard on that, hope they will be able to deliver speeds up to 12 Mbps per passenger. Delta Airlines proposes a pass for 24 hours at the price of 12$. There is also a annual pass for 400$. They say the speed is as fast as a high speed mobile provider. Many passengers who tried could not have better than a slow connection. Emails were ok, SD short movies also but not fluid. 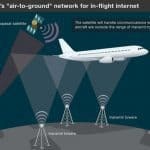 Another American company, American Airlines, proposes a 2$/minute of wifi connection based on the same technology. More recently, Air France-KLM announced the start of their Wifi service by february 2013. They will install a wifi network inside the cabin and a satelite antenna on the external part of the plane. Two boings 777-300 will be used for the test. We do not know yet about prices but apparently it could cost between 5 to 30$ for a long flight. VoiD services will be abled, so basically we will be able to use Skype or other voice service on board. The interesting question is about electro interferences. How the plane will behave with all these different devices connecting and disconnecting from the internet. Should it not bring issues with the electronic? Also, how to avoid the noisy neighbor having a conference call while you are trying to sleep? Humm… complicate. Anyway, things are moving and improving so we can say that having Wifi in-flight is just part of the normal evolution of mobility. Info sourced on several flying companies, Delta, American Airlines, Airfrance-KLM, Lufthansa and Singapore. All images and texts are copyrighted with no reproduction rights available.